I told a friend the other day, I'm always looking for a new good wine. I am also always looking for a new good cyclist to follow. I enjoyed reading through this list by Podium Cafe of the latest greatest Cyclocross racers from Europe. I am hoping I will find more of an interest in the CX racers from Europe, because honestly Jeremy Powers does nothing for me as a fan. Tim Johnson is amazing to watch on a bike, but a bit monotone. Although I enjoyed watching his 9ball diaries very much. 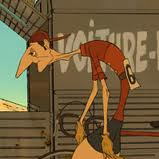 Every time I see Ryan Trebon I am reminded of the animated character in the movie Triplets of Belleville. Don't you think it looks like him?! Meanwhile I am heading to a local CX race tomorrow, should be interesting. Do we all think doping is cheating or not? Why is Cyclocross so aesthetically ugly?